In the Action column, click the arrow button, and then click Edit Profile. 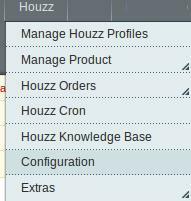 The created profile is saved and listed on the Houzz Profile Listing page. Click the Save and Upload Product button to save the profile and make ready to upload the product on Houzz.